Soak the prunes and raisins in lukewarm water for at least 30 minutes. Separate the cabbage leaves and blanch in hot water for a few seconds, drain and plunge into iced water (retains the colour), then leave to drain thoroughly and cool. Mix the minced meat with the rice, salt and pepper. 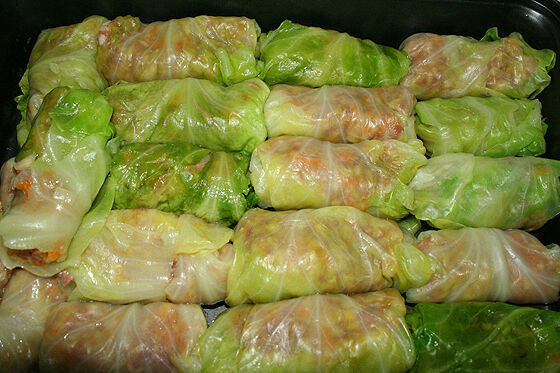 Place 3-4 tablespoons of the mixture on each cabbage leaf, roll up and tie with kitchen string. Fry the rolls briefly in butter to colour on all sides. Place the rolls in a heat proof dish. Beat 250 grm of the sour cream with the flour and add together with the drained raisins and prunes to the pan juices, boil briefly and pout over the cabbage rolls. Cover and simmer gently for 35 minutes. Cut off the string before serving. Serve the rolls with the dill and the remaining sour cream.